FAKE is completely written in F# and all build scripts will also be written in F#, but this doesn't imply that you have to learn programming in F#. In fact the FAKE syntax is hopefully very easy to learn. Use --version to specify the version of FAKE. See the global_tool branch of fake-bootstrap for ideas to bootstrap in your CI process. Bootstrap via the fake dotnet new template. The template bootstraps FAKE and sets up a basic build-script. See the template page for more information. These scripts have no versioning story. You either need to take care of versions yourself (and lock them) or your builds might break on major releases. Bootstrap via paket clitool, this is basically the same as DotNetCliToolReference but managed via paket. See the paket_clitool branch of fake-bootstrap in particular the build.proj file. Whenever you update the dependencies (part of the example), you need to delete the <script>.fsx.lock file and re-run fake to update all files and intellisense! This example will guide you by adding a fake script to your existing .NET application. This is all we need for now to declare that we need the Fake.Core.Target module and want to enable intellisense. Now run fake run build.fsx to make fake prepare our environment. Now our IDE can load the dependencies and we will have intellisense enabled (you might need to reopen the script file on some editors). Now we need to remove the build.fsx.lock file and run fake build in order to restore the newly added Fake.IO.FileSystem module. You can explore the APIs for example by writing Fake.IO. and waiting for intellisense (or pressing Ctrl+Space). You can remove Fake.IO once you put open Fake.IO on top. We introduced some new concepts in this snippet. 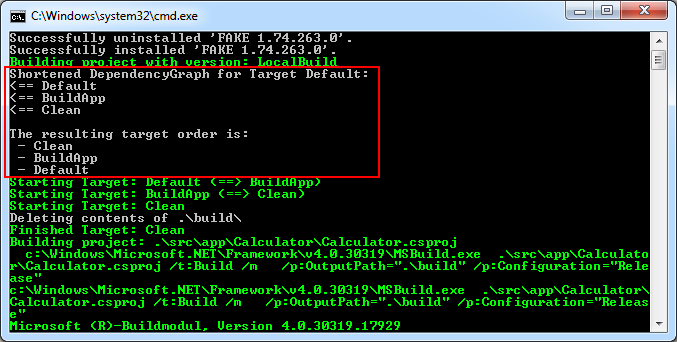 At first we defined a global property called buildDir with the relative path of a temporary build folder. 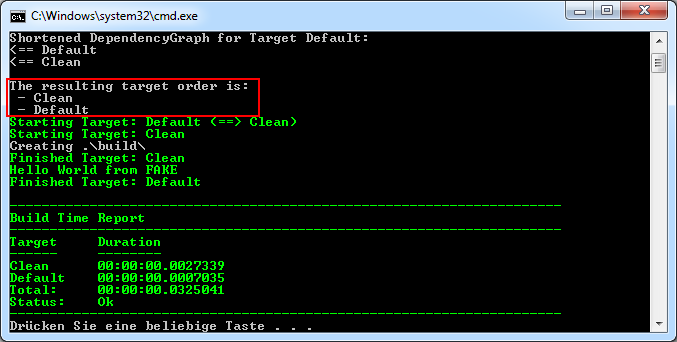 In the Clean target we use the Shell.cleanDir task to clean up this build directory. As explained above this simply deletes all files in the folder or creates the directory if necessary. In the next step we want to compile our C# libraries, which means we want to compile all csproj-files under /src/app with MSBuild. Again we need a new module for this, namely Fake.DotNet.MSBuild. In order to find the right project files FAKE scans the folder src/app/ and all subfolders with the given pattern (the !! operator was imported from Fake.IO.FileSystem via open Fake.IO.Globbing.Operators). Therefore a similar FileSet definition like in NAnt or MSBuild (see project page for details) is used. 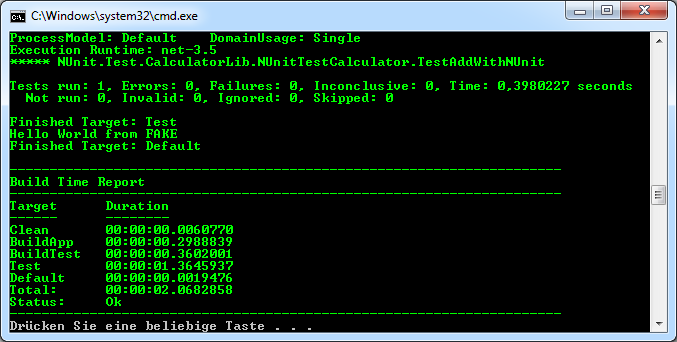 |> MSBuild.runDebug id testDir "Build"
Our new Test target scans the test directory for test assemblies and runs them with the NUnit runner. FAKE automatically tries to locate the runner in one of your subfolders. See the NUnit3 task documentation if you need to specify the tool path explicitly. look at the quick start guide which has the same information in a more dense form. look at FAKEs own build script or other examples across the F# ecosystem. Add fake build scripts to your projects and let us know. Automate stuff with FAKE and use standalone scripts. Write your own modules and let us know - we love to add them to the nagivation or announce them on twitter.